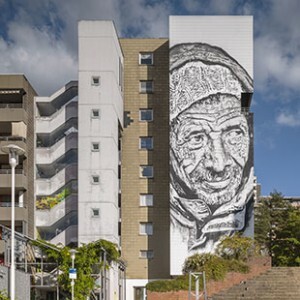 Hendrik Beikirch, also known by his alias »ecb«, creates eye-catching works of documentary and fictional portraiture that traverse the personal and the private. His distinctive monochromatic wall murals and interior works for galleries and museums confront viewers with richly storied subjects that fascinate through their sheer force of personality. At once anonymous, quotidian and enchanting in appearance – each of Beikirch’s figures has a story to tell. More than mere subjects, we find in his works genuine characters, made all the more fascinating by their anonymity. The reduced color palette and striking contrasts that characterize Beikirch’s portraiture underscore the vulnerability of his subjects, while the scale of these works invites viewers to consider the relationship between individual and society, viewer and subject, public and private. Looming large in the post-industrial cityscape, Beikirch’s documentary works are studies in humanity. Responding to cultural shifts in the perception of beauty brought about by the ubiquitous presence of digital media, Beikirch rejects the sleek youthfulness that predominates in modern visual culture in favor of an aesthetic vision that couples painterly sensibility with the techniques of photorealism. The world-weariness, grit, and cautious optimism of his subjects imbue these works with a sense of the familiar. There is something reassuring to be found in the melancholy that radiates from these faces. Monumental in scale, transforming the act of painting into a bold venture. 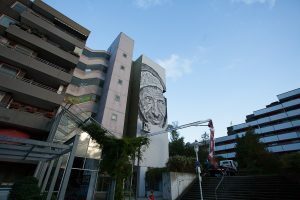 Beikirch’s murals are not so much interventions in the urban landscape as they are our silent companions, reminders of our common humanity and representations of both actual individuals and the diverse populations of the modern city. Roadside shadows, they command our attention; at times melancholic, other times brusque in their sensibility. The subjects of his fictional works are inspired by his imagination and do not adhere to human proportions, instead they are distorted, fragmented and subtly surreal in appearance. Questioning both their surroundings and the conventions of portraiture, these works share the hyperrealist aesthetics of his documentary work, while employing skewed perspectives to accentuate the image and its character. Chance encounters, fleeting glimpses and snatches of conversation form the inspiration for images that dissolve spatial boundaries and translate personal histories into expressive works. Part of a new generation of artists, Beikirch seeks to break down the spatial dichotomy of the interior and the exterior, incorporating the principles of composition and technique applied in his interior work to his creations in public space and vice versa, forging positive connections between these two spatial domains in the process. Just as his works of public art evoke an atmosphere of familiarity, his productions for interior spaces reflect the anonymity and transience of the contemporary urban experience. Beikirch has created work at diverse locations all around the world. In recent years his works have become increasingly monumental in scale, transforming the act of painting into a bold venture. 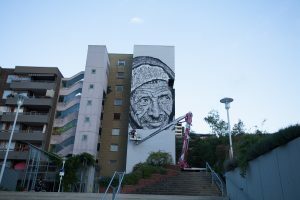 In august 2012, he traveled to South Korea’s second largest city, the metropolis of Busan, where he painted the largest mural in Asia – a 236-foot tall monochromatic mural of an elderly fisherman. 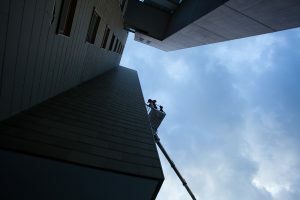 The mural, one of his most ambitious works to date, is set against the dramatic backdrop of the futuristic Haeundae I’Park tower complex, designed by acclaimed architect Daniel Libeskind. This iconic work has since been followed by similarly breathtaking creations, including the largest murals in India and the Benelux countries. These massive murals were created without the use of projectors or grid sketches, making each a work of outstanding precision. Few artists match the sophistication and charm achieved in Beikirch’s portraits. At a moment in history where the visual matters more than ever, and the public has become jaded by the glut of images, Beikirch has developed a new way of reproducing and understanding reality which transcends the visual dimension as its grapples with the nature of interior and exterior space. Mesmerizing viewers with the captivating aura of his subjects, his works occupy a unique position in contemporary art. His is a modern take on classical portraiture, reduced in its color palette, ambivalent in its reserved presentation, yet full of warmth and infused with a rich sense of humanity.